You know how sometimes you have yarn laying in your stash forever just begging to be used? I bought this Lion Brand Ice Cream Yarn over a year ago and now I have FINALLY gotten around to using it. Isn’t the Cookies and Cream color lovely?! 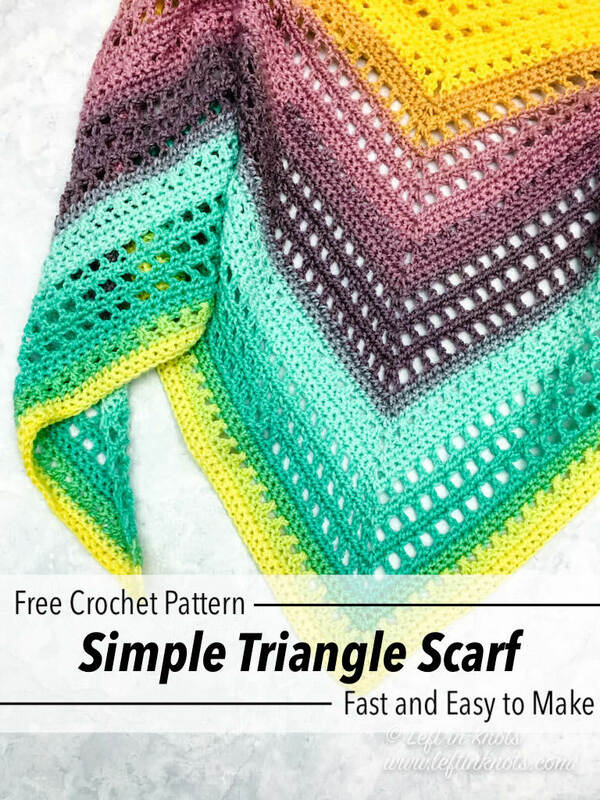 Keep scrolling to see the free crochet pattern! Lion Brand Ice Cream yarn is a light weight acrylic that comes in several different variegated colors and it is soft and wonderful to work with! It is 100% acrylic so that means washer/dryer safe…which I always appreciate for wearables ;) If you prefer, this pattern could be made out of approx. 788 yards of a comparable light weight (category 3) yarn. Sign up with your email address to receive blog updates about free patterns, yarn deals and giveaways from Left in Knots! Lion Brand Yarn Ice Cream or Ice Cream Big Scoop - I used 2 skeins of ‘Cookies and Cream’ (which is 788 yards total). The Big Scoop skeins are about the equivalent to 3 skeins of the smaller balls. You could use this if you wanted your shawl a little bigger! This shawl can easily be made larger or smaller. Just repeat Rows 7-18 until you reach your desired size. Each full repeat adds about 12" to the width of the shawl. Ch 4 counts as a DC+ch 1- the third chain counts as the ‘top’ of the DC and the fourth chain counts as the ch 1. 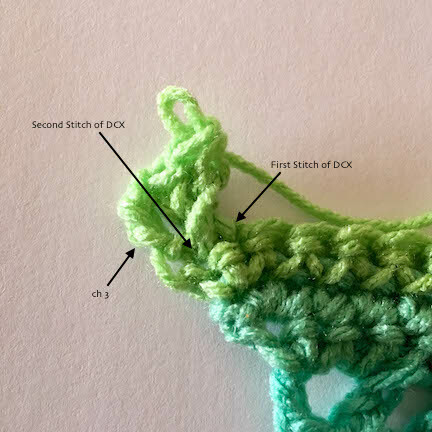 Remember to work into these spaces accordingly when you are crocheting. If you prefer to Ch 3 as a DC+1 thats fine! It’s a tension preference for people. If you do, your second chain will count as the ‘top’ of your DC and your third chain will count as the ch 1. 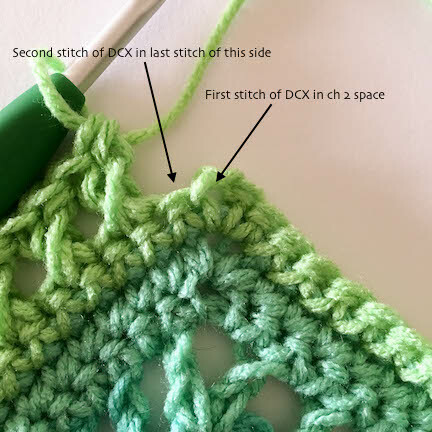 Ch 3 counts as a DC at the beginning of DCX rows. This shawl should probably be blocked when done. I'll be honest, I didn't for the photos and I wish that I had! Row 1: Work 7 SC into magic circle, pull tight. Row 11-13: ch 1, 2 SC in first st, SC across until you reach the ch 2 space, (SC, ch 2, SC) in the ch 2 space of the previous row, SC across, 2 SC in last st. Turn. Row 14: Ch 4, DC in next st, ch 1, skip 1, *DC, ch 1, skip 1, repeat from * until you reach the ch 2 space, (DC, ch 2, DC) in the ch 2 space from the previous row, *ch 1, skip 1, DC, repeat from * until you reach the second to last stitch of this row, ch 1 (do NOT skip 1), DC. Turn. Row 15: ch 1, 2 SC in first st, SC across until you reach the ch 2 space, (SC, ch 2, SC) in the ch 2 space of the previous row, SC across, 2 SC in last st. Turn. Row 16: Ch 4, DC in next st, ch 1, skip 1, *DC, ch 1, skip 1, repeat from * until you reach the ch 2 space, (DC, ch 2, DC) in the ch 2 space from the previous row, *ch 1, skip 1, DC, repeat from * until you reach the second to last stitch of this row, ch 1 (do NOT skip 1), DC. Turn. Row 17: ch 1, 2 SC in first st, SC across until you reach the ch 2 space, (SC, ch 2, SC) in the ch 2 space of the previous row, SC across, 2 SC in last st. Turn. Row 18: Ch 4, DC in next st, ch 1, skip 1, *DC, ch 1, skip 1, repeat from * until you reach the ch 2 space, (DC, ch 2, DC) in the ch 2 space from the previous row, *ch 1, skip 1, DC, repeat from * until you reach the second to last stitch of this row, ch 1 (do NOT skip 1), DC. Turn. Repeat Rows 7-18 until you reach your desired size. I repeated this sequence a total of 5 times which brought me to Row 66. I added one last row of SC sts which was a total of 67 rows. Use neutrals like I did or check out their bright color combos for a fun summer shawl! Enjoy!